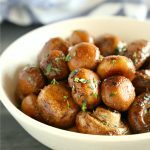 These White Wine and Garlic Mushrooms make the perfect side dish made with only 5 ingredients! They're delicious with grilled meats and veggies! Ready in 15 minutes or less! Heat a large skillet over medium-high heat and add the butter. When the butter is melted, add the mushrooms and toss them in the butter until coated. Let the mushrooms cook for about 1-2 minutes tossing them once or twice, and then add the garlic powder, thyme, and a pinch or two of salt and pepper. Continue to cook for about 4-5 minutes until the mushrooms begin to cook down and release their juices. Add the white wine and continue to cook, uncovered, for about 8-10 more minutes until the wine cooks off and the mushrooms reach a golden brown colour. Serve with a sprinkling of fresh thyme.